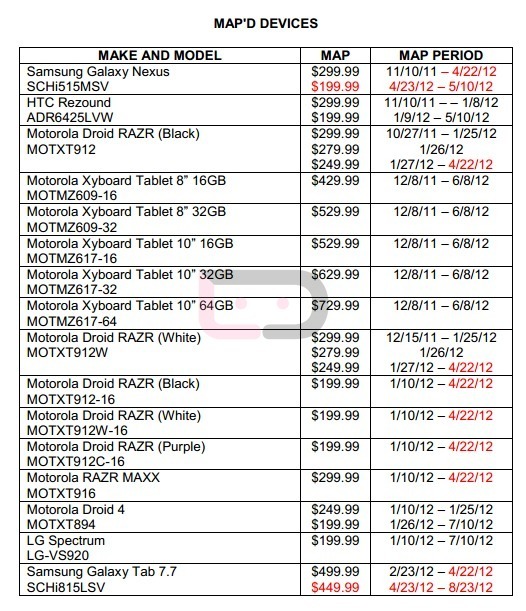 According to the latest MAP (minimum advertised price) list from Verizon, the Galaxy Nexus will drop to $199 on 2-year contract starting April 23. If you were thinking about cruising into a store this weekend to pick one up, you may want to hold off until Monday to save yourself $100. There is a chance that this means that we will see a 16GB version of the phone around that day, but sort of doubt it. This looks to be just a price reduction. Still no word on a release for the 16GB Nexus in either white or dark. On a related note, all of the RAZRs come off MAP Pricing on April 22, which is usually a good sign that new phones are around the corner. With the DROID RAZR HD (formerly the DROID Fighter) and the Incredible 4G popping up more often, this should get you excited.